[0:43] <chandwki> I'm getting, "ssh: connect to host raspberrypi port 22: Connection refused"
[0:52] <chandwki> mete that worked! [6:30] <chisight> hmm, he left. nginx was a pain to get php to work with. [10:57] <vlt> I need a more than 2 GB big SD card nowadays for the latest Raspbian? Really?!? [11:09] <frodox> vlt, why do you so surprised? [11:31] <LiberalHippie> u sux dix for niggers, yes? [11:34] <LiberalHippie> does that make me high? [11:35] <drjam> sigh. a troll. how do i mute people opnm here again? [11:36] <LiberalHippie> drjam: are you an op, or are you asking about a client side ignore? [11:37] <LiberalHippie> you get the idea, drjam? [11:44] <ikmaak> does not matter, this is self-incrimination. love! [11:45] <Tachaway> what, run out of pics of your mum? [12:09] <windless> any advice how to approach it? [12:09] <windless> what things i will need? [12:09] <windless> or is it possible the way i am thinking? [12:11] <windless> how u control switches with pi? [12:12] <windless> can we control physical switchboard switches anyhow with pi? [12:15] <lordievader> windless: Start with a simple echo example, I suppose. And build from there. [12:26] <windless> lordievader: hi, yes I am going that way only.. I can keep track of multiple clients and authenticate new ones. [12:27] <windless> is there extra hardwares needed? [12:28] <lordievader> As in prick a cable? [13:26] <vlt> windless: A Raspbery Pi has GPIO ports to connect stuff to. [13:30] <windless> vlt: thanks, so a simple circuit setup with a fuse to protect pi, to control the main powerboard switches will work? [13:42] <vlt> windless: This is where multiplexing or shift registers are possible solutions. [13:44] <vlt> windless: Shift registers can be chained. 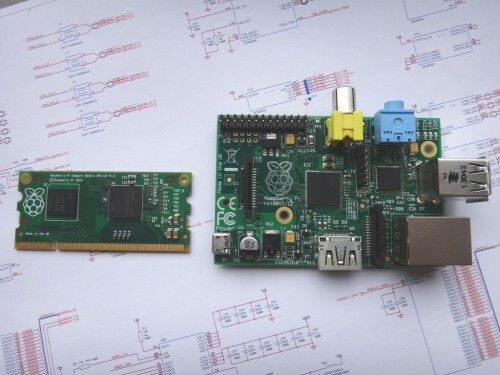 [13:46] <Dan-NS27x> I just found out about raspi-gpio. when running, it shows up to 53 GPIOs. Is there a reference that shows what they all are? (USB, HDMI, etc.?). I've been looking but haven't found one yet. [14:01] <Dan-NS27x> I've seen plenty of the GPIO Pinout charts, but the output of raspi-gpio is showing more than what's on the GPIO connector. [14:20] <smojphace> Hi, apt-get dist-upgrade just clobbered my running kernels lib/modules.. anything I can do to prevent that? [14:20] <smojphace> (Other than reboot)? [14:32] <Dan-NS27x> yeah, it could be really useful. [14:33] <Dan-NS27x> that page I linked shows something called "Compute Module" which I haven't seen before. Apparently the extra pinouts can be available with that but requires additional development. [15:45] <Skippy_42> Hey guys, does anybody know a source where I can see all the different raspbian versions and what kernel versions they use? [16:59] <DeepTroubleMaybe> it needs 5v to trigger relay...did I order the wrong relay board? [17:05] <DeepTroubleMaybe> But since this being for work I don't have time to wait for an omega to come from overseas..
[17:07] <chisight> yes, to trigger a 5v relay will need a transistor. if you want to do this without additional components, you got the wrong thing. [17:08] <DeepTroubleMaybe> Okay...what is the right thing? [17:11] <chisight> one designed for a pi or other 3v3 system with limited current capabilities. [17:15] <chisight> the infamous "they" make everything. [17:17] <chisight> I've never used a relay, i prefer triacs to switch high voltage ac. [17:25] <chisight> my choice is a triac controlled by a zero cross optotriac. [17:28] <chisight> DeepTroubleMaybe: 3 components wired up. resistor, zerocross optotriac and a triac sized for your load. [17:35] <DeepTroubleMaybe> super confused...using what I stupidly bought before asking questions. I need a transistor between the relay and the pi? [17:39] <mycel> DeepTroubleMaybe: send it back, I guess? [17:44] <chisight> DeepTroubleMaybe: yes, a transistor is needed to control a 5V device with a pi. you need an npn type with enough current capability to handle your device. and a resistor to limit current to the transistor's base. [17:56] <chisight> DeepTroubleMaybe: sure, but you'd still need a transistor to run that. it needs too much current. [17:58] <DeepTroubleMaybe> So...theres no relay board that just sits nicely on the pi and just works? [17:59] <mycel> what do you want to drive, DeepTroubleMaybe? [18:00] <chisight> DeepTroubleMaybe: i'm sure there are lots of them. [18:01] <chisight> DeepTroubleMaybe: note, the latest link you show would burn out the gpio pins if wired as they show. [18:06] <DeepTroubleMaybe> Okay so lets look at something the Omega 2 by Onion.io I have one with a power board and relay expansion would that work? [18:06] <DeepTroubleMaybe> or is that going to blow my gpio on my omega 2? [18:07] <chisight> i'm not familiar with that product. [18:10] <chisight> still not familiar with it. a link doesn't make me familiar. you'll have to look at how much current it's I/O pins can source. (the latest amazon link needed to source 15mA to 20mA per pin. [18:10] <chisight> the omega2 can't run raspbian so is really off topic in here. [18:13] <DeepTroubleMaybe> Okay so ontopic chisight then... do you have a link to a wiring guide for the thing I bought the first link? [18:19] <chisight> yep, they don't. doesn't mean it's going to work at all or if it does that it will work for very long. [18:20] <DeepTroubleMaybe> So help me out using that diagram can you show me where the transistor and resistor would go? [18:21] <chisight> the npn transistor base connects to the gpio through a 2.2K resistor. [18:21] <chisight> the transistor emitter goes to ground. [18:22] <chisight> the transistor source goes to 5V through a resistor sized to supply the unknown current that the relay needs. [18:23] <chisight> the relay input also goes to the transistor collector. [18:24] <chisight> the transistor needs to be sized such that it will handle the unknown current needed by the relay. [18:25] <chisight> generally, you buy transistors rated for double the intended current. [18:25] <chisight> you will also need a protection diode across the coil. these are often included in relay boards, but if one is not provided, add it. [18:26] <iKarith> Unless you work for Wun Hung Lo, in which case you buy transistors rated for exactly the current you expect to run through them, bias them with rusty resistors, and put the whole thing together with hot glue. [18:28] <chisight> ^^^ yes, always. this is why we don't buy from Wun Hung Lo, unless we know exactly what the limitations are and how to work with them. [18:30] <chisight> DeepTroubleMaybe: correction, that last link you sent does have a transistor. it's a completely different board from the one you linked earlier. [18:39] <chisight> iKarith: the tutorial relay module apparently wasn't made by Wun Hung Lo, the transistor is rated 500mA and the relay 89mA. they even included a flyback diode rated .9A and 40V. [18:40] <DeepTroubleMaybe> Chisight which link sorry? [18:41] <chisight> that's a completely different module from anything you linked on amazon. [18:42] <chisight> assuming the module they sell actually matches the module pictured and the components aren't fakes, it seems to be fairly well made. [18:43] <chisight> DeepTroubleMaybe: yes, that looks like the one in the tutorial. [18:45] <chisight> unfortunately the amazon photo has been blurred, so i can't be sure. the part numbers were barely readable on the tutorial and are not readable at all on the amazon link. [18:51] <DeepTroubleMaybe> Next question do I really need an rpi3 for this I mean itll just run cron would a pi zero be better? [18:54] <chisight> depends on what the cron job is doing. it all seems overkill to me for a buzzer. [18:58] <chisight> all this to run the break bell. [19:02] <chisight> attiny, but that's a different channel too. [19:04] <[ITN]Le_Chat> Hello, I wanted to install open365 on my Piserver with Raspbian. Is it possible ? [20:50] <Skippy_42> Did someone manage to put the RTAI realtime kernel into a raspbian OS on the pi? [21:58] <redrabbit> ShorTie: great ! [21:59] <redrabbit> do you have a how-to to recommand ? [22:45] <hal9k_> Hi! I Cannot get php5 working with nginx at my raspberry pi3. Anyone who can help me and maybe look my config file through? Wold be really appriciated. [23:30] <hal9k_> Anyone know where I should seek help about it? It doesnt look like the raspberry pi Stackexchange is super active. [23:41] <muelli> hal9k_: do you have logs? [23:43] <hal9k_> Yeah! But If you can find a email for pestmeester.nl, then i would be glad. I would like to send the edit and some other stuff to the host of the site.